On a night which could have been decisive for Liverpool had they won, City clipped their wings to deter them from pushing further away. Liverpool were on an unbeaten run and in top form, handing hammering defeats to their oppositions and then on came a re-ignited Manchester City. 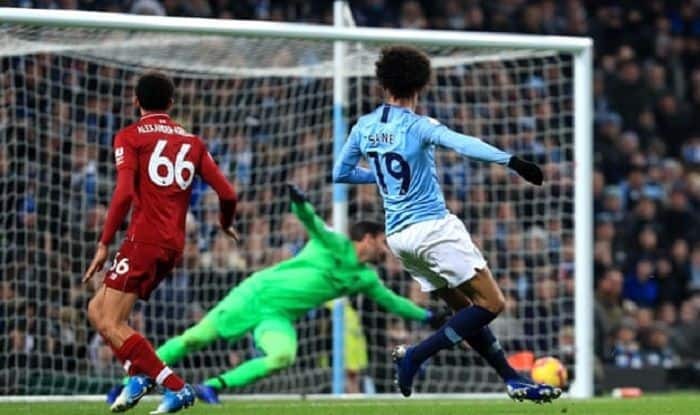 Leroy Sane’s late winner was the conclusion of the thrilling contest which ended 2-1 at the Etihad Stadium on Thursday. The match lived upto the expectations as the blockbuster and potentially season-defining match of the year in the Premier League. A week ago, City had suffered three defeats in five games and that Liverpool were on a roll, but now the gap at the top of the table has been reduced to just four points. Which means it would take Jurgen Klopp just one and a half game to lose the lead in the title race to City, should they continue their form here on wards. Sergio Aguero’s 40 minute strike gave the Pep Guardiola side a lead which was cancelled out by the in-form Brazilian, Roberto Firmino at the 64th minute of the match. On a night which could have been decisive for Liverpool had they won, City clipped their wings to deter them from pushing further away. Now, it’s on. This match sets us up for the rest of the season – even a draw could be costly in this seemingly two-horse title race. Both teams are eyeing something their team have never achieved – Defending champions Manchester City are aiming to retain a Premier league title for the first time in their history, while Liverpool are looking to win the Premier League title for the first time in history- despite having won 18 top-flight titles, they have never won it in the Premier League era.